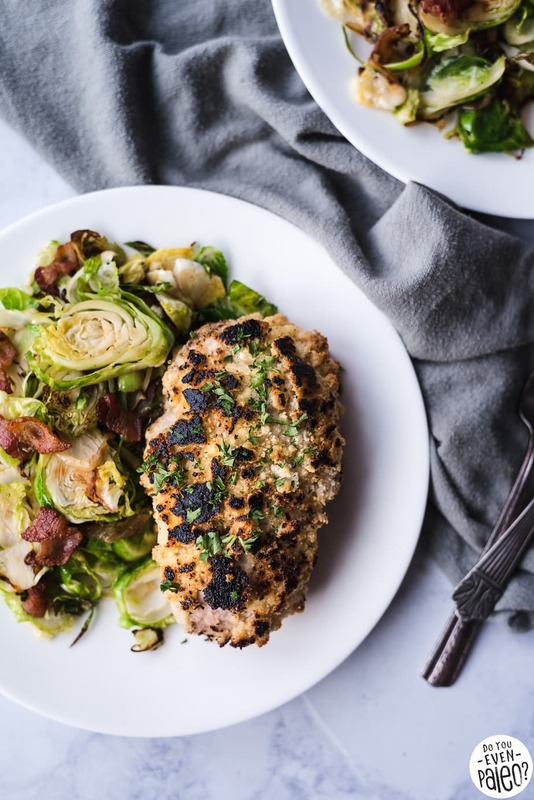 Warmer weather is tremendously close, but I’m already making a transition in the kitchen with this Macadamia-Crusted Pork Chops with Bacon Brussels Sprouts recipe. 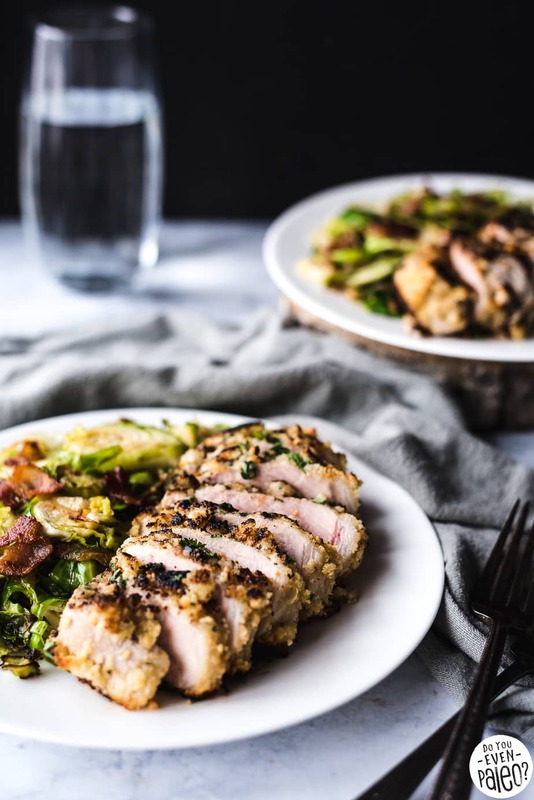 Give these breaded pork chops a quick sear before transferring them to a hot oven to finish off. 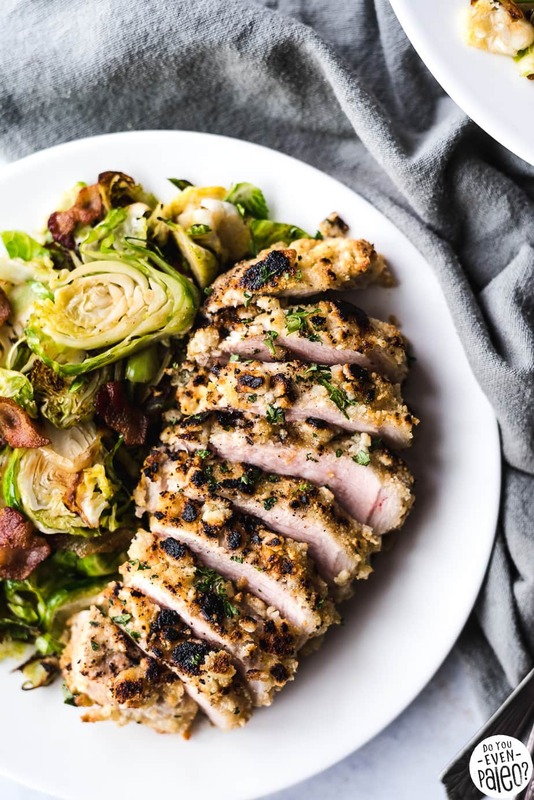 While they’re in the oven, you’ll have time to cook the bacon brussels sprouts for a quick side dish to serve with the pork chops. Plus, it’s all gluten free, paleo, and Whole30. Healthy food, big flavor, cooked quickly. Let’s do this! Something about macadamia nuts just screams summer, doesn’t it? I’m not exactly certain why, but I associate macadamia nuts with tropical foods and climates. Perhaps it’s because Hawaii has been a large producer of macadamia nuts since the 1940s, according to Wikipedia. Which might explain why this recipe was inspired by a meal eaten in Hawaii. Not by me, though. A friend and her husband went to Hawaii last summer. She posted a picture of macadamia-crusted pork chops with brussels sprouts, raving in the caption about how good it was. Naturally, I jotted it down as an idea for the blog… And here we are! I could have waited until summer was in full force before posting this recipe (it’s currently April), but looking outside and seeing snow… I want to warm up, even if that means turning to Hawaii-inspired eats way before I should. Seriously. It’s snowing. 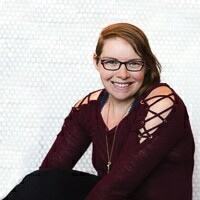 In April. Could be worse, though. Because on the bright side, I can make macadamia-crusted pork chops anytime I damn well please. You don’t need a grill OR nice weather for this recipe. Just a skillet, an oven, and all the right ingredients. And maybe the world will take a hint and melt all this snow. Wishful, irrational thinking, I know. But a girl can dream, right? Okay, let’s get to this recipe. I guarantee it’s not as hard as you might assume. 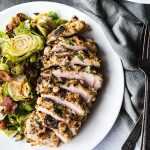 You’re just breading the pork chops with a blend of ground macadamia nuts and coconut shreds, searing it, then transferring all of it to the oven to finish cooking. The hardest part is dipping pork chops in egg. I swear! Add the macadamia nuts, coconut shreds, salt, pepper, and rosemary to a blender or food processor. Process until a uniform meal is formed. Empty into a shallow bowl or plate. Whisk the eggs until smooth. Transfer to another shallow bowl or plate. Pat the pork chops dry with paper towels. 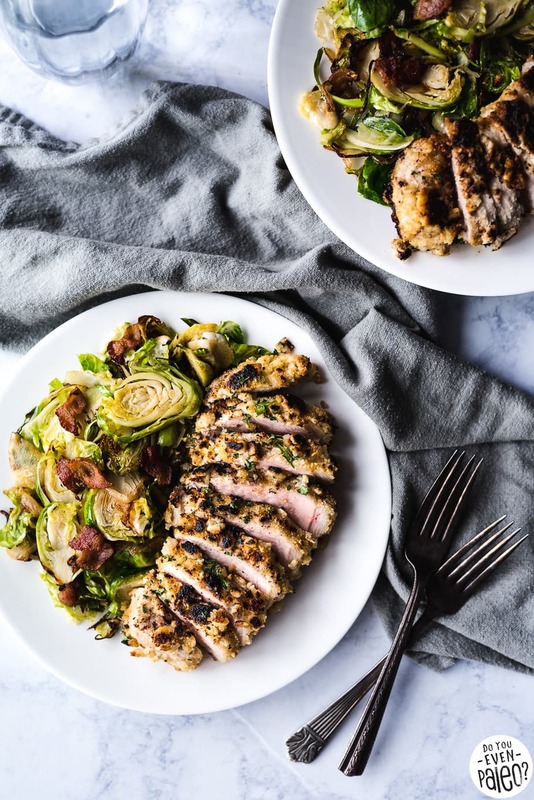 Dust the pork chops completely with arrowroot powder. Dredge the dusted chops first in the egg, letting excess liquid drip off. Transfer to the macadamia nut mixture, making sure to cover the entire surface of the pork chops. Repeat until each pork chop is covered. Heat 1 tablespoon olive oil in a skillet over medium-high heat. Sear the pork chops for 3 minutes on each side, then transfer to the oven and cook for an additional 8 to 12 minutes. Meanwhile, prep the veggies. Heat another skillet over medium-high heat and add the remaining 1 teaspoon olive oil. Add the bacon and cook for 5 to 8 minutes until crisp. Add the sliced onion and saute for 4 minutes, until lightly browned and translucent. Add the brussels sprouts and cook for 8-10 minutes, until brussels sprouts have softened. At this point, everything should be ready to eat! 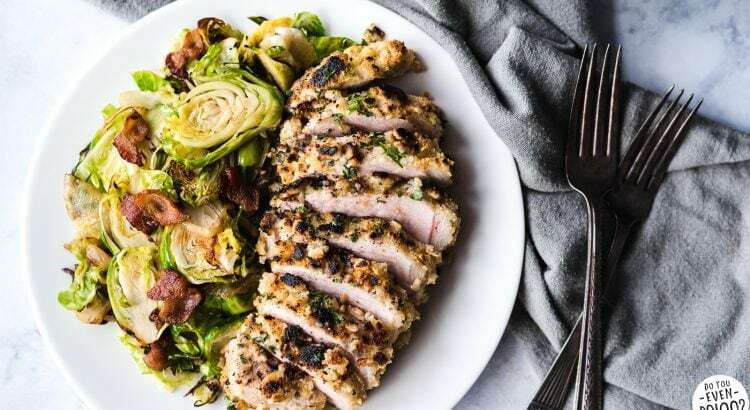 Serve each pork chop with a hefty serving of brussels sprouts. How do you roast the macadamia nuts? Hey Angel! My go-to for most nuts is: preheat oven to 375 degrees F. Spread nuts out on a parchment paper lined baking sheet. Roast the nuts for 8-10 minutes, until they are fragrant but not burned. Hope that helps! I used boneless, but either would be just fine! You may just have to cook a bone-in chop slightly longer. Don't subscribe All Replies to my comments Notify me of followup comments via e-mail. 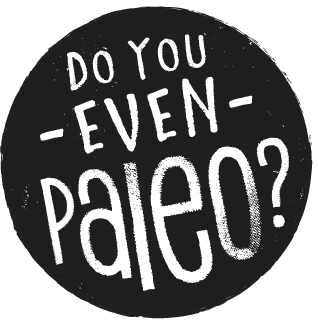 You can also <a href='https://www.doyouevenpaleo.net/comment-subscriptions/?srp=3932&srk=87505361eee98908ddf6ccb8681f50d6&sra=s&srsrc=f'>subscribe</a> without commenting.